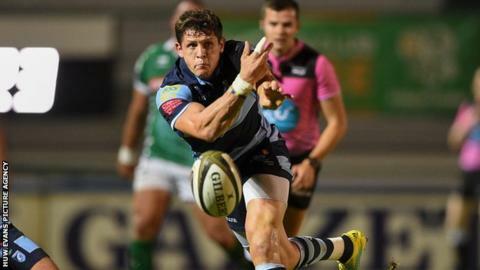 A last-minute converted try gave Benetton victory against the Cardiff Blues at the Stadio Monigo. Tommaso Allan scored the opening try of the game but ill-discipline at the scrum gifted the Blues a penalty try. Sebastian Negri crossed next for Benetton while Gareth Anscombe and Jarrod Evans kept the game close with three penalties each. However it was not enough as Allan kept his composure to score the last-gasp conversion after Monty Ioane's try. It was another heartbreaking late defeat for the Blues after they suffered a similar fate against Leinster on the opening weekend. Allan and Evans opened the scoring from the boot for their respective teams before the Italy international crossed for the opening try after collecting Tito Tebaldi's chip. The Blues hit back six minutes later. Benetton were penalised a number of times in quick succession at the scrum before referee Sean Gallagher ran out of patience with the Italian side's pack and awarded the Welsh region a penalty try. Two more penalties from Evans gave the Blues a six-point lead at the break but it was Benetton who started the second half the stronger. The Italian side scored 10 unanswered points, including a Sebastian Negri try, to retake the lead before the Blues brought on Wales internationals Anscombe and Josh Navidi. Anscombe scored three penalties as the Blues moved into a 25-20 lead with seven minutes remaining. However it was not enough for the the Welsh region, who were reduced to 13 men late on as Brad Thyer and Rhys Gill were sin-binned. Benetton took full advantage, Ioane crossing in the corner before Allan's conversion gave the Italians victory. Cardiff Blues: Morgan; Harries, Lee-Lo, Halaholo, Lane; J Evans, L Williams; Thyer, Dacey, Arhip, Earle, Thornton, Turnbull, Jenkins (capt), N Williams. Replacements: E Lewis, Gill, D Lewis, Navidi, Robinson, T Williams, Anscombe, G Smith.